Tehillim 3:1, "And he shall be like a treee planted by streams of water, that yields its fruit in its season, whose leave shall never whither and all that he does shall prosper". May all those who have their name on this tree yield beautiful fruit and be always in season. May your leaves never whither and may everything you do prosper! This artistic masterpiece by World reknown Artist Isaac Algavi which is already up in House II, is planted in living waters with live fish swimming between its roots. 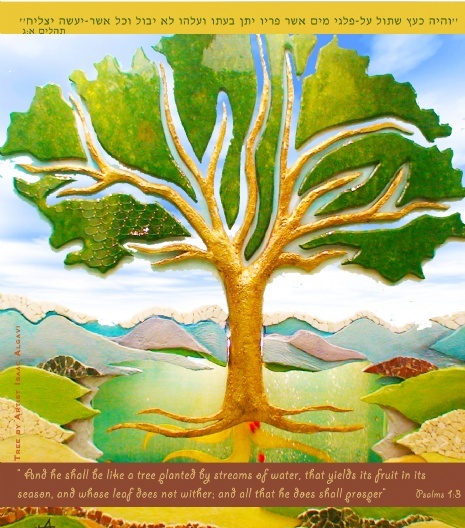 The tree will be replanted in the new building, G‑d willing very soon! Please help the tree yield more & more fruit by having your name permanently displayed on 1 of its limited leaves! Please donate your leaf on the Tree of Life! To remember your loved ones, you can buy a memorial plaque for the Yortzeit board. Please click submit only once. Please wait a few seconds for acknowledgement online that your information was received. We will send you a receipt once your donation has been processed. You can make a credit card donation using paypal or google checkout. Donate your old car, boat or property to help the efforts of Chabad. You'll save on taxes, its hassle free and best of all, you'll be happy you're partnering up with the worlds largest Jewish organization, helping us help others! Call Chabad Chayil today at (305) 770-1919. The Chai Club enables you to have a part in every Mitzvah we do, every month! To learn more or to join and start living it up click here! Its fun & it makes cense!